In the world of motorcycle racing, one name came before all the rest. “Smokin’ ” Joe Petrali tore up the race tracks on his Harley-Davidson in a decade of dominance from the mid-1920s to the mid-1930s. Petrali was one of the last great Class A racing stars as he competed in board track racing, dirt track, speed records and hillclimbs. He also won a record 49 American Motorcycle Association national championship races, a mark that would not be surpassed for 55 years, until 1992, when Scott Parker won his 50th AMA national. Petrali’s affinity for motorcycles began as a young boy, growing up in California where he would watch the Class A racers of the 1910s, such as Don Johns and Charles “Fearless” Balke. Balke wore leather pants and puttees while racing to keep his legs from burning, a look that Petrali would adopt years later. Petrali’s racing regalia consisted of leather pants, puttees and a surplus WWI Balloon-Jumpers Helmet. Spit-shined dress shoes, immaculate black and white sweaters, and often a shirt and tie completed his wardrobe. “I tried to clean up the motorcycle field,” explained Petrali. “I always tried to look good”. Petrali raced for the first time at age 14 in an economy run held at the California State Fairgrounds in Sacramento. Petrali raced 176 miles on one gallon of gas to win the national economy class for 30.50-cubic-inch motorcycles. Petrali would run endurance races for three more years, even setting the record in a tie with Archie Rife when the two putted around for three days and four nights before the race was finally called a tie. At age 17, Petrali hit the race track at full speed, finishing second in his first speed race. Four years later, Petrali ran his first race for Harley-Davidson when he set a board track record by averaging 100.36 mph in a race he won easily in Altoona, Pennsylvania. Petrali wasn’t supposed to race for Harley-Davidson that day. 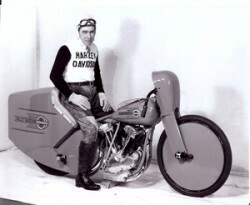 An injury to Harley racer Ralph Hepburn gave Petrali a chance to enter the race. Soon after the victory, Petrali signed with Harley-Davidson and won his first three races before setting out to dominate the sport of motorcycle racing. When his career ended, Petrali went into aviation and worked for Howard Hughes, becoming the flight engineer for the “Spruce Goose,” the world’s largest flying boat. Petrali was born on February 22, 1904 in San Francisco, California, and died of a heart attack on November 10, 1973 in Casa Grande, Arizona, while conducting an economy run for Buick. In his later days, Petrali was famous for always carrying an AMA membership card that identified him as AMA Life Member #1. He was inducted into the Motorsports Hall of Fame in 1992 and into the National Italian American Sports Hall of Fame in 2006.